Tied Quilts - Can They Be Quilted? Most of the time YES. Most of the time, it is a T-Shirt quilt that was commissioned by a non-professional. They did not know what they were doing. Because we have a 'soft spot' for T-Shirt quilts, we offer a special rate for quilting these type of quilts. If you use the Crazy Puzzle pattern- scaled to fit your quilt, we offer a special discounted rate over our usual rates. And no, we are not prejudiced because you tried to do it yourself or used someone else's pattern. 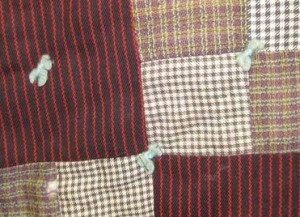 This is an example of a quilt that has been tied. In this case, the 'ties' are pretty close together, and would probably hold up over time and many trips to the laundry room. Many amateur quilters will just tie in the corners of the intersections of the t-shirts, meaning they could be up to 12 or even 18 inches apart. That means that every time the quilt is laundered, the batting (if they included any) inside is wadding up and disintegrating. As one of the premier 't-shirt quilt' creators in the country, we get a lot of projects where we 'fix' quilts that were done by the non-professionals or well-intentioned family or friends. Because these folks do not have the equipment that quilting professionals use, they end up working on a project that is beyond their capabilities. We do ask to see the quilt in person or photos via email to evaluate whether we can help you with your project. In most cases, the results have been awesome and the owners have been thrilled with the results. Picture at left is the backside of a quilt where we fixed quilting by a non-professional. This quilter sewed along the edges of the t-shirt (note the straight lines). We loaded the quilt and did an all-over pantograph, ignoring the quilting that was already there. Depending on what the original 'quilter' used to tie the quilts, there might be holes in the fabric that might not be acceptable to the owner. I have fixed quilts that were 'tied' with yarn. This can leave a larger hole in the quilt, that might not go away with the usual ironing or squirt of water. However, usually the holes disappear with the first laundry or a few shots of steam from an iron. In some cases, there is a bit of 'fullness' that results from the their original quilt. In this case there we might not be able to 'quilt it out'. If you have a tied quilt that you would like to have quilted, please contact us to discuss it. We had one quilt that came in, that only had 4 ties in the entire quilt, others a tie every couple of inches. These are the easy ones to fix. In some cases, the crafter tried to quilt the quilt themselves. In many cases we 'CAN' fix it. The images show where they tried to quilt 'in the ditch' . In this case we did not take out the quilting, just loaded it on the longarm machine and added our own quilting. See the straight lines of quilting? That was the original quilting. Do not remove the ties first. We will do that as each row is ready to be quilted. It may be that all ties are removed before quilting, and we will get a better result from removing the ties before loading the quilt on the machine. Go ahead and remove one tie to determine if the resulting hole is acceptable to you - or not. 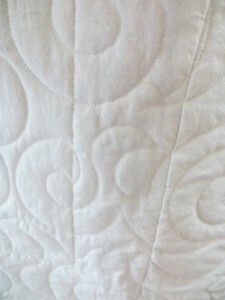 If repairs need to be made to an older quilt, you should take care of this prior to sending it to be quilted. We can do minor repairs (such as popped seams), but do not count on us doing any major repairs. If a quilt is old and fragile, we reserve the right to not do any machine quilting. For the most part, we are only doing edge to edge or 'panto' style quilting. Custom quilting takes a lot of time, and in order to accommodate everyone, we have to limit the amount of 'custom' quilting that we accept.